Groundwater is any water that lies in aquifers beneath the land surface. While some of the water that falls as precipitation is channeled into streams or lakes, and some is used by plants or evaporates back into the atmosphere, most of it seeps underground in the cracks and spaces present in soil, sand and rock. Underground layers of rock that are saturated with groundwater are called aquifers. The groundwater contained in aquifers is one of the most important sources of water on our planet, and can be brought to the surface through natural springs or by pumping. Groundwater is constantly replenished (recharged), as part of the natural water cycle, by rain and melting snow, and to a smaller extent by surface water (rivers and lakes). Groundwater recharge is an important process for sustainable groundwater management — the volume of water extracted from an aquifer should be less than or equal to the volume of water that is recharged. Artificial recharge — the practice of increasing by artificial means the amount of water that enters an aquifer — is now gaining increasing acceptance for the support of sustainable groundwater management. Groundwater is among the most important natural resources in the United States. It provides half our drinking water and is essential to the vitality of agriculture and industry, as well as to the health of rivers, wetlands, and estuaries throughout the country. However, the future availability of groundwater to meet domestic, agricultural, industrial, and environmental needs is uncertain. Large-scale development of groundwater resources is leading to declines in groundwater levels not only in the United States, but also at a global level. In many arid and semi-arid regions in which water scarcity is almost endemic, groundwater plays a major role in meeting domestic and irrigation demands. Unfortunately, it is massively used for irrigation without adequate planning, raising serious concerns on the sustainability of such an intensive use of groundwater resources. Now, results from two new studies published in the journal Water Resources Research show that, while civilization is rapidly draining some of its largest groundwater basins, there is little to no accurate data about how much water remains in them. The researchers conclude that significant segments of Earth’s population are consuming groundwater quickly without knowing when it might run out. The studies characterized groundwater losses via data from space, using readings generated by NASA’s twin GRACE satellites through measurements of dips and bumps in Earth’s gravity, which is affected by the weight of water. In one of the studies (Quantifying renewable groundwater stress with GRACE), researchers examined — between 2003 and 2013 — the planet’s 37 largest aquifers. The eight worst off were classified as overstressed, with nearly no natural replenishment to offset usage. The most overstressed is the Arabian Aquifer System, an important water source for more than 60 million people. Five additional aquifers are extremely or highly stressed, depending upon the level of replenishment — they’re still in trouble, but with some water flowing back into them. Not surprisingly, the most overburdened aquifers are in the world’s driest areas, which draw heavily on underground water. Climate change and population growth are expected to intensify the problem. In the companion paper (Uncertainty in global groundwater storage estimates in a total groundwater stress framework), the researchers conclude that the total remaining volume of the world’s usable groundwater is poorly known — and likely far less than suggested by the current available estimates, which vary widely. In their study, the researchers note not only that that historical estimates probably overstate — unrealistically — the total groundwater volume, but also that the dearth of groundwater is already leading to significant ecological damage, including depleted rivers, declining water quality, and subsiding land. Below is a lighthearted animation that tells the story of groundwater: where it is, where it comes from, and where it goes. There is no doubt that “water is the new oil”, and the global impact of this relatively new concept will become clear in the next few years. In most arid and semi-arid environments, groundwater is the only valuable resource. It is required to sustain both rural and urban populations. Droughts are responsible for increasing mass migration and displacement, going hand in hand with the long-lasting effects of wars occurring in countries with arid and semi-arid environments and already stressed resources. However, massive droughts are occurring everywhere, Australia and California being just examples. We keep over-stressing resources everywhere. We could get started by avoiding wasting and polluting groundwater. The study discussed in this post does not seem to be looking at the status of groundwater. We don’t know how much groundwater there is on the planet. How can we know how much of this groundwater is polluted? We can start by examining what we can probably assess best now, and that is how much water is wasted on a daily basis. 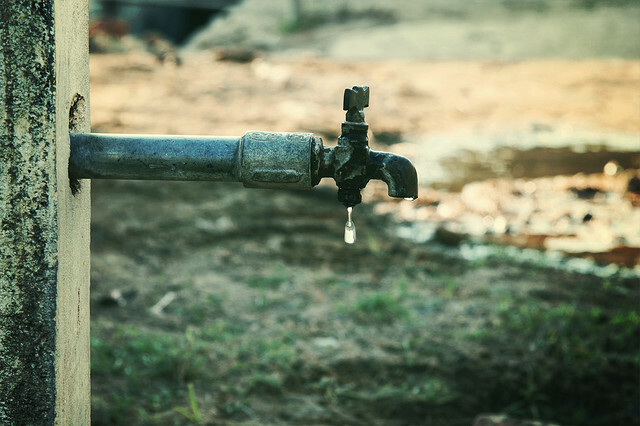 It is expected that, by 2025, two-thirds of the world’s population will face water shortages. Agriculture consumes more water than any other source and wastes much of that through inefficiencies, depleting aquifers all around the world. Aquifer depletion is a huge threat that matches climate change. Sadly, very little effort goes in one of the easiest ways to save our groundwater: redesign of outdated agricultural practices to make them more efficient and less wasteful.